The holidays are officially upon us as we enter the last full week of trading for the year. CBOT markets are in the green to start the week while cotton is slightly in the red as I write this article. March corn is up about a penny after trading into last week’s low on the open last night, trading below 350 right now. . Soybeans are up about 2 cents to just below 970 Jan, while July KC wheat pops its head above 450 in the July contract. 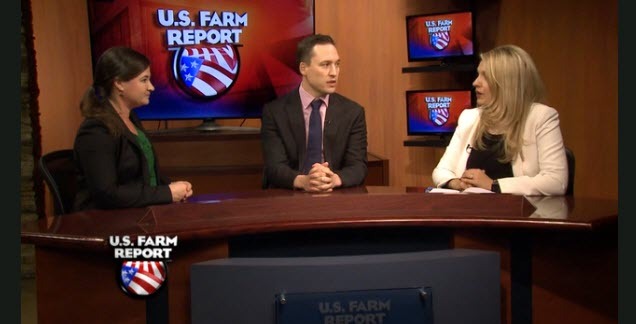 Before I get into each market, below is a link to the US Farm report show I was a guest on last weekend. Thanks to all of you who wake up at 5 am in your local area’s to watch it live. If you missed it, you can watch both segments below. I did a few other things for Agweb as well you can catch throughout the week there.Click on the photo below to watch. The week ahead will wind down the government data releases and put the market into holiday mode as we get into next week. 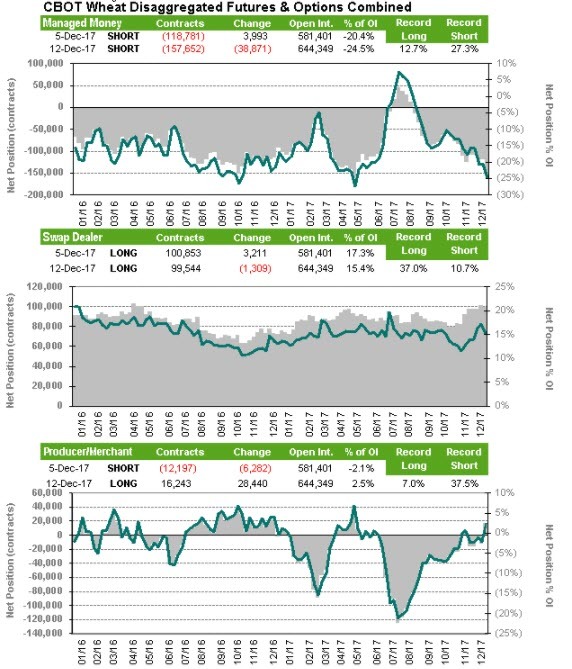 From a USDA perspective, it will all be about livestock in the back half of the week with Cattle on Feed and the Quarterly Hog Report coming out on Friday. 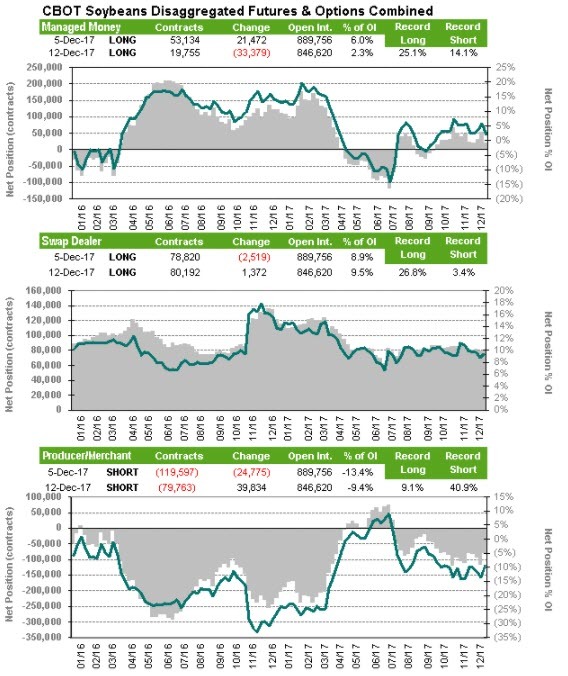 The normal reports will hold importance but at this point the market is short in beans, record short in corn and near record short in wheat, while cotton markets are near record long. I expect we will see some covering of these positions into the end of the year. Weather is going to wag the tail of the markets over the next few weeks with little data changing things until the Jan WASDE. It sounds like the rainfall projected over the next few weeks looks to be diminishing on the models. We are hearing more than half of Argentina will see much less than normal rainfall during December, which has been the case for October and November. This extends into Southern Brazil as well. The heat has arrived in Argentina as well, it sounds like mid 90’s to 110 was observed this weekend. Rains were observed up north, I am hearing little problems here and there but nothing major. The real issues in the affected areas will stress crops through January. I expect this to lift prices there in the coming weeks, which should put the US at the bottom of the price ladder when it comes to price in corn. I look for a bottom in corn to come in soon on this. Corn prices closed on contract lows last week but are trying this morning to get back above 350 March. 379 December futures are observed, there is chart support down at 375. 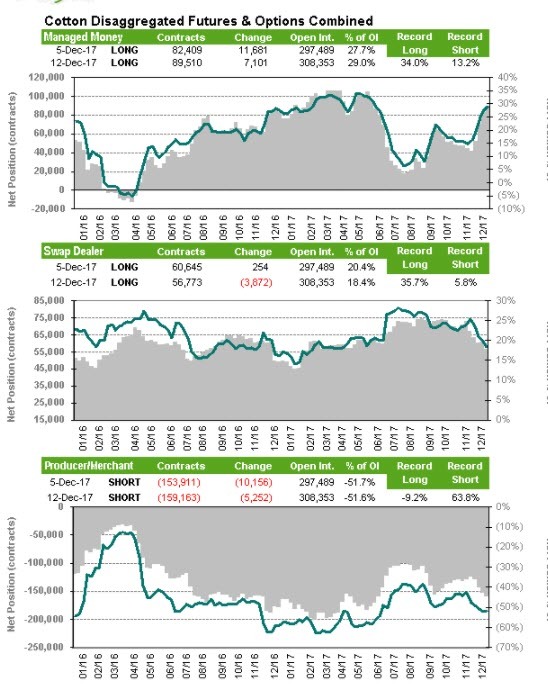 Informa came out on Friday with expectations for an 89.7 million acre corn crop for 2018, this is down about 1.25 million from a year ago. A producer I work with connected to the US Corn Growers mentioned at the annual national meeting that US acreage is expected to come down more in the lines of 4-6 million acres, which would be the horse of another color. I expect that dramatic drop is due to smaller sample size but the fact remains corn farming is something some producers will avoid next year. Does this change much in the short run? No, but I think given the fight for acreage, if Argentina or Brazilian corn production looks dire we will see price need to encourage planting. December corn expired at 335 on Friday, I expect March to have plenty of support between 348 and 335 over the next few months. COT specs are record short while the commercials have begun to put on some shorts here. All this market needs is a spark to rally. Soybean futures have been the whipping post of the market going back to Tuesday of the week prior. Markets closed at 1015 as my plane touched down in KC two weeks ago, they trade at 969 right now. The bears will point to slow US exports, higher US acreage in the coming year (Informa at 91.4 million vs 90 a year ago) and a pretty good start to the Brazilian growing season as a reason for markets to be where they are. The weather in Argentina is a concern though and the demand, while not great in the US, is going gangbusters globally. Exports in the last few weeks have been poorer than a year ago, but many think as we move ahead in 2018 we will see China come back to our shores in droves. I expect a buying spree before the Chinese new-year in February. Producers who are looking at call strategies to sell into may want to look at get something priced before the end of the year. COT has the soybean trader almost net neutral at this point. Wheat futures are inching higher this morning as cold weather looks to engulf a lot of the wheat belt over the next few weeks. Kansas is now 100% under drought conditions per the latest monitor. I do not worry about winter kill, but the market is short and any reason to rally will be taken. A year ago we saw similar price action at this time only to have the board rally to above 450 in March by the time the highs were made. I look for July KC to have support near 440 in the short –medium term. KC and Chicago wheat markets are near record short. I think buying calls on breaks makes a lot of sense in this market if you are a producer. Cotton prices had a fantastic rally last week, but did not close above the 76 cent price level highs (post Irma. We currently sit at 75.75 after Chinese cotton production was reduced 2.7% higher from last year. The cotton markets have rallied to new contract highs on awesome exports and Indian cotton production problems. There are rumors being thrown around right now that Indian cotton production is off 15% from where the USDA has pegged. US supplies are very loose right now from the 20,000 foot view, but on the ground given the low mic problems in Texas things are not completely normal. I expect the USDA to raise cotton exports in the months ahead, which will bring our carryout down from 5.8 million bales to maybe even as low as 5 if this Indian data is true but given acreage for next year and the fact specs are record long already (issues are baked into price) I think pricing some 2018 cotton makes sense. Inversions are wide right now and the Dec is at contract highs. Seasonals stay strong through the early Jan, I look for the market to stay strong as these tax bills are passed. 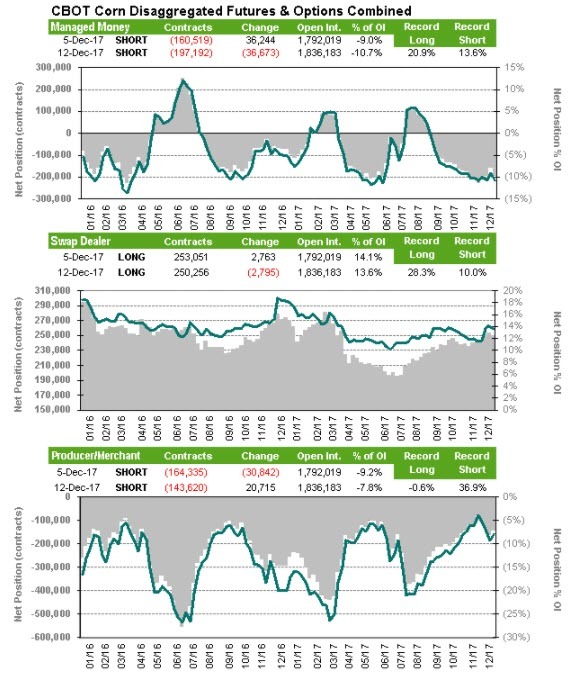 COT data shows near record long specs as of Tuesday, I imagine we are record long right now.